Where to start with this review? I’ve been struggling with it for nearly two weeks and still don’t actually know how to sum up my feelings. I love Supernatural, it’s number six on my top shows of the decade list and I recommend it to anyone I think is worthy of it. But for all my enthusiasm about past seasons I’ve been torn in my response to season 5. I have a suspicion that the problem has been that this is the first season I’ve watched week by week, rather than in a massive marathon covering four seasons in just three weeks. Maybe the show is just better when you watch it in big chunks; the structure and pacing works better when the humorous diversion episode is just 45 minutes in your 3 hour marathon, not something that means there’s nearly two weeks between plot episodes. Story wise, there’s some epic stuff going on this season. To keep things as non-spoilery as possible the Winchester Brothers are trying to stave off the apocalypse, everyone (from Lucifer all the way up to the archangels) is telling them they are destined to play out certain roles, and they just don’t want to. The first half of the season is spent in an increasingly desperate drive to find a solution that doesn’t screw over humanity as a whole. The second half is a pretty depressing investigation of what you do when it turns out the situation really is un-winnable. The show was originally ‘planned’ as a five year arc (although happily it has been picked up for a sixth season) and one of the things that worked extremely well was the bringing together of elements from throughout the story. Questions that you didn’t even know you had were answered in a satisfying way, characters returned and arcs were concluded. There was a lot of really meaty stuff going on, talking about the very nature of destiny, religion, good and evil, personal responsibility, free-will. But at the same time, in true Supernatural fashion there were a few fun episodes, with some wickedly observant comedy in them, which would then have a completely epic final 5 minutes, the credits would role and you’d be left sort of staring at the screen with your mouth open. The thing is I just didn’t feel like I enjoyed the season as much as I have others. Even season 3 with it’s very depressing overall story, it never really felt heavy; between the black humour the boys have about their lives and the hope they and the audience shared that things would work out, it never felt like it was wallowing. But a lot of season five was spent angry, bitter and wallowing, any spark of hope was so relentlessly stomped on that I often struggled to motivate myself to watch the next episode. I think Supernatural lost some of its subtlety this season. One of the things that I’ve always adored is that the characters very rarely talk about their feelings – they just don’t need to. The character development, writing and acting have been so smooth that the audience knows instantly how they feel about any situation, the fun thing is watching them put on the fronts that they’re fine, or confident. You also know when the other characters know that someone else is pretending, but aren’t saying anything. Emotional breakdowns and confrontations had been limited to pretty much one each per season so far, but in season five they seem to happen every other week. I don’t want the boys to be broken, they’re just not as much fun. This review is coming across very negative, which is exactly why I’ve held off on writing it for so long. The thing is that Supernatural is still superb, but season five was superb in a similar way to Battlestar, rather than in a similar way to Buffy. Battlestar was epic, dramatic, relentless, it asked difficult questions and took no prisoners – it was amazing, but depressing as anything. Buffy meanwhile was superb because it hid the epicness and drama and questions under a layer of humour, fun and coolness. I think Supernatural crossed over this season, there was a line from Sam “remember when we just used to hunt wendigos” referring basically back to the second episode of the show, and yes, I do remember it, and I miss it! That’s not to say that season five wasn’t great, amazing and impressive. But could we just go back to having two guys, in a cool car, killing monsters to the accompaniment of a great soundtrack? I’m not sure I can take the emotional turmoil any more. Even if this review sounds a little down, I really cannot recommend this series highly enough. 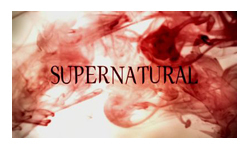 Supernatural – The Complete First Season [DVD] is just 9 quid at time of writing!